This six piece dance outfit was worn by the character Tony Manero portrayed by actor John Travolta in the 1983 film STAYING ALIVE. The outfit consists of a leather headband, pair of leather armbands, and a gray leather loincloth with matching leggings. Mr. Travolta wore the outfit in the sequence near the end of the film where Tony finally achieves his dream and dances in a Broadway play. 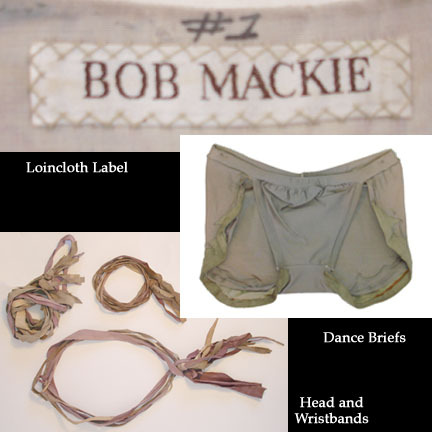 Bob Mackie designed the leather loincloth and has the number 1 handwritten above the label. STAYING ALIVE was the sequel to the hit movie SATURDAY NIGHT FEVER and was directed by Sylvester Stallone. 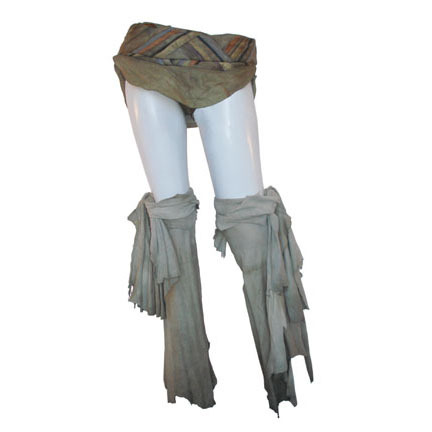 The garments are in good screen used condition with some minor evidence of distress that occurred during their use in extended dance sequences. Accompanied by a letter of authenticity from the costume house.